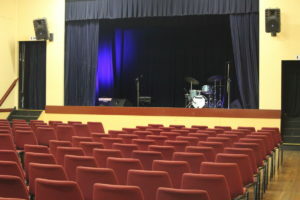 There are around 200 comfortable cloth chairs, originally installed in the old Springwood Civic Centre that may be arranged in many configuration subject to Australian Standards for auditorium seating. 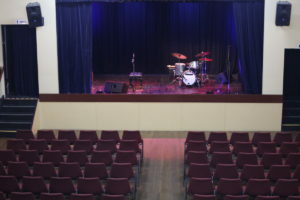 Seating numbers should be discussed with Blue Mountains City Council when booking the hall through the Council officer on 47805000. If you require particular seating for any of our shows due to a disability please contact us to discuss your needs. There is a disability toilet in the main auditorium. The main hall has a very large quite ceiling fan to keep you comfortable during hot weather. There are electric wall heaters to keep you cosy in winter. There are two kitchenettes in the hall complex. One kitchen is located off the backstage area and one off the portico entry. You will have use of fixed water urns; one oven; one heating oven and a number of microwaves. There is a small refrigerator in each kitchen. There are fixed sinks. Cutlery and plates and cups are available at no charge. Please discuss any specific needs with staff at Blue Mountains City Council when booking the hall through the Council officer on 47805000. The street address is 284 Great Western Highway Lawson. Off street parking is available adjacent to the hall in a designated car park. Enter off the highway via Orient Street and then turn into Yileena Avenue and at about 200 metres on the right is the entry to the hall past the old RFS building. If full you will find further parking along Yileena Avenue or otherwise park in Honour Avenue and walk back to the hall. Also you will find parking in Orient Street and Mary Street and it is a short walk to the hall. There is no parking on the highway immediately near the hall. There are 2 car spaces for holders of disability parking permits. A ramp leads to the entry on the western door to the auditorium.